Does the idea of resting on over 6,000 small sharp spikes sound appealing? No? Well… it should. Let me explain the what and why. I’m a wellness junkie. I love discovering and trying different natural and holistic ways of improving my health and the quality of life. I don’t recall where I heard of the Spoonk mat, but I was instantly intrigued. I love massages, but I’ve never experienced acupuncture. The mat promised to be acupressure- a combination of the sensations of massage and acupuncture, great for reducing muscle stiffness, promoting relaxation, and improving the quality of sleep. Other claimed benefits include improving the immune system, promoting general whole-body healing, increasing circulation, and reducing muscle tension. While I’m a wellness junkie, I’m also very aware of marketing tactics and skeptical of big claims. My Spoonk mat sat in my Amazon wishlist for months before I finally decided to order it. The mat arrived flat rather than rolled up in the bag, which was a little surprising. After the first use, I decided I was sold. This mat deserves far more hype than it has received. 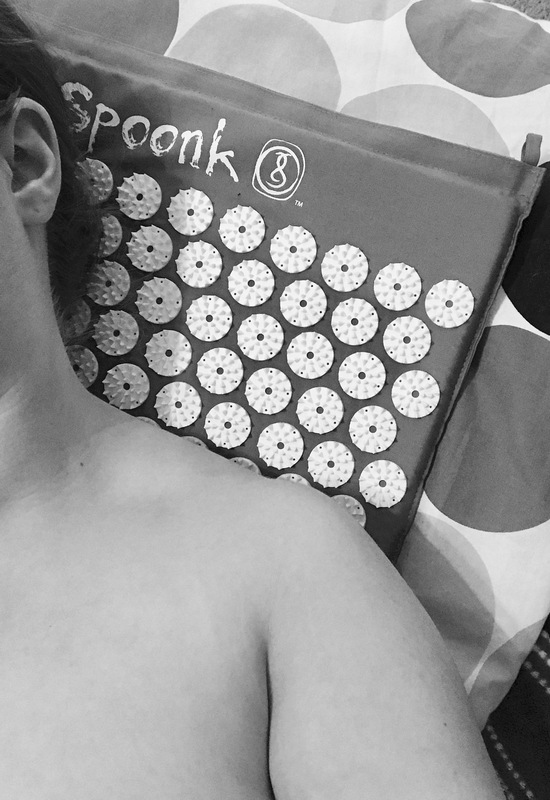 The Spoonk Organic Hemp Mat works on the simple principle of acupressure – the healing art known as the Shiatsu massage. By stimulating increased circulation with 6210 acupressure points on problematic areas, you relieve muscle tension and pain, while at the same time rejuvenating and rebalancing the whole body. I can’t vouch for all of the claims, but laying on the mat is definitely relaxing and soothing. I use it a few nights a week for between 15 and 30 minutes, usually while I’m letting a face mask set. Once I get off the mat, I can feel the increased circulation and feel both more awake and more relaxed. I’ve recommended the mat to coworkers and friends I’m so obsessed with it. Admittedly, the idea of laying on spikes isn’t appealing. The ideas brings to mind stepping on a lego, but the reality is that these specially designed spikes don’t cause pain, but instead deliver soothing pressure to tight muscles and stimulate the nerves. The mat is actually quite comfortable and any pain or sensitivity disappears quickly. This might be TMI for some, but my time of the month always comes with unbearable back aches. The pain will wake me up or keep me up at night and makes finding a comfortable resting position nearly impossible. During the time last month, I used my Spoonk mat with a small pillow under where my lower back rests to provide a bit more pressure. Paired with the heating pack on my uterus, the mat really helped ease the pain. Halle-freaking-lujah. The spikes do not feel sharp when you lay on them, but they are. when I use the mat on my feet, I either stand on it with socks on or I sit down and gently rest my feet on the mat, pressing down and then lifting up so that the pressure isn’t do harsh on my bare feet. I also try to place myself carefully on the mat; if I position myself incorrectly, there might be some irritation. Additionally, you WiLL see pinpricks on your back after laying on the mat. The indents fade fairly quickly and don’t bother me, but if you are more sensitive you will likely want to wear a thin shirt while using the mat. Have you ever tried the Spoonk mat? If not, would you? Share your favorite wellness tools with me in the comment section!